The fearless ladies who command the stage are Tricia Black, Ann Pornel, Karen Parker, Ashley Comeau, Paloma Nuñez, and Kristen Rasmussen. For the performance that we attended, Aimee Ambroziak performed in place of Rasmussen. Right from the beginning, it’s clear that the sketch comedy of the evening would be politically driven baring strong social commentary on the struggles women face not just among men but among other women as well. The sketches are delivered in rapid fire succession so it’s hard to remember all of them in the end. I love the Rubanesque rap that features Pornel, Black and Comeau. A shout out to the old school female rap groups from the 90’s a la Salt n Pepa, the well choreographed, well performed, and righteously funny number celebrates plus size women. The fact that my partner Vance and I happen to be seated at the front to draw the trio’s full attention to me added to my appreciation for this bit. It’s hard to forget a sketch that features the infamous inflated T-Rex costume. With Parker inside playing the character of a corporate manager frustrated that the men in the boardroom are more focused on her outfit, T-Rex and all, than her presentation. Though her commentary is great, I laughed so much it hurt from watching an inflated T-Rex get short-arm waving mad. Our favorite sketch of the night is the one that featured the most improv due to audience input. A talk show segment featuring Parker as the New Agey crystal-hoarding author. Though watching the improv play out between Parker and the hosts Nuñez, Black and Ambroziak is gut-splitting funny, Black stole this sketch for me. I couldn’t keep my eyes off her. Her character as a guest host, one who was struck by lightning 14 times, meant her character experienced delayed reactions and would scream uncontrollably until Ambroziak shut her mouth. The two stand out performers for us have to be Black and Parnel — both are blunt, sassy, and delightfully sarcastic. The scene with Black as a coma patient finally waking up after 10 years to learn from Parnel of all the horrific ways the world has changed in that time, fueled by spit-take reactions that result in Parnel with a face full of water, is comedy gold. While discussing our final impressions upon leaving the show, we realized that though the show as a whole is incredibly funny and a delight to watch, the comedy focused more on socio-political commentary and less on landing punch lines. It didn’t take away from our enjoyment of the show, but we would have loved to have seen more scenes and jokes end on a solid punch line rather than be left hanging in the air. She the People is great. It’s a hilarious show, smart and incredibly well written. There are stand out moments for audience participation and the show makes for a perfect friend night or date night. You’ll laugh, you may laugh until you cry, and you’ll leave just a little more woke. She the People is playing at The Second City (51 Mercer Street) until until November 25 2018. Performances run Thursdays to Sundays, 10:00 om on week nights and 4:30 pm on weekends. See website for details. Tickets are $32 General Admission and $47 Reserved Admission on week nights, $27 General Admission and $42 Reserved Admission on weekends. Tickets can be purchased online, over the phone by calling 416 343 0011, or in person at the box office. Run Time: 100 minutes with a brief intermission. Audience Advisory: This performance contains coarse language and mature subject matter. 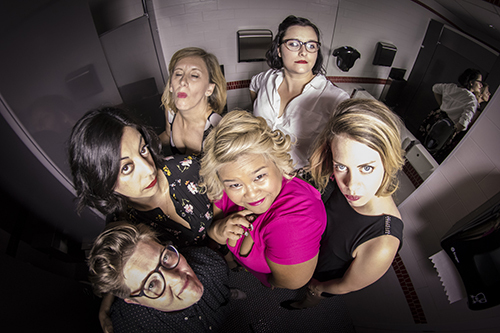 Rated R.
Photo of (clockwise from bottom left) Tricia Black, Paloma Nuñez, Karen Parker, Ashley Comeau, Kristen Rasmussen, and Ann Pornel by Paul Aihoshi.